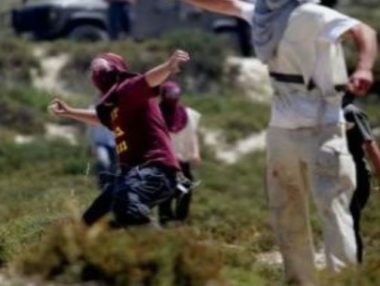 A group of extremist illegal Israeli colonialist settlers attacked, Tuesday, Palestinian High School students and teachers, in the northern occupied West Bank, according to WAFA. The attack took place in Orif village, near the illegal Israeli Yitzar colony, south of the West Bank city of Nablus. Adel al-Amer, a member of Orif village council, told WAFA that scores of settlers attacked and stormed Orif Secondary School for Boys, and subsequently surrounded the school, trapping the school teachers inside. The colonists hurled stones at homes in the village, which led to confrontations with the residents, before Israeli soldiers opened fire at the residents attempting to defend their homes. Ghassan Daghlas, a local official told Maan that 50 extremist Israeli settlers attacked the school, stating that one student, injured by rocks thrown by the extremist settlers, was treated at the scene. In addition to damaging school windows, the settlers damaged vehicles belonging to some of the teachers. Locals told Maan that Israeli forces raided the village at the same time the settlers attacked, causing clashes with locals. Military vehicles fired tear-gas bombs, and stun grenades at the villagers, with no further injuries reported. It is important to note that this is the eleventh time this school has been raided since the beginning of the school year, disrupting the education of Palestinian youth. Under International Law, all settlements built in the occupied territories of the West Bank and East Jerusalem, are illegal, as stated in the article 49 of the Fourth Geneva Convention. Therefore, as the occupying power, Israel is in violation of International Law, as 500,000 – 600,000 of its civilian population has colonized the Palestinian land which it occupies.